Girlia's Cards: You're Invited to a Pool Party! I like entertaining, baking, needlepoint, and papercrafting. I love nice stationary, really nice writing pens, and pencils. I enjoy going to office supply as well as craft stores,and meeting new people. The blog and video tutorial world is new to me. I love watching others making new and different things. I really enjoy learning to make unusual cards as well as different folding techniques they are of special interest to me. Thank you for stopping by to view the cards on my blog. Your comments are welcome. Enjoy and may GOD bless you. You're Invited to a Pool Party! Welcome to our Pool Party Blog Hop! We hope you have fun! We wanted to do something that Celebrated Summer Fun at CTO! So Jump In! For BLOG CANDY I am offering your choice of a Michaels, Joann's, or Hobby Lobby Gift Card worth $15. Just leave a comment you don't have be a follower, but it would be appreciated if you did. Again thanks for joining us and have fun! 2 cute, ready to jump in! Oh wow this is a really cute card and the turtle life saver is adorable. Thanks for the chance to win. So cute, I agree, ready jump in! Love the pool shape, great idea! Love the pool shaped card and the little floatie! What a super cute pool! Love the floatie -- such a cute card! I'm a new follower. TFS! I love the pool and the little floatie in it. Great Job!! This is so super cute Gloria! I love the shape! Makes me want to run out and jump in the pool! Great job! Oh my gosh, what a cute invitation!!! I love it! That is the perfect invitation for a pool party. So very cute. super cute! thanks for the chance to win! I love your card! So cute and a unique shape! Thanks for the chance to win! Wow your pool is wonderful. Love all the details. I'm glad to be in the hop with you. Great invite! Love the water details! Great job as usual. Adorable card! Thanks for sharing! Oh my goodness! This is fabulous! Super fun! Love the pool toy! This is such a cool card- I love that it is shaped and the little floatie is so cute! New follower! TFS! what a cute card! Love the blog hop!! What a great shaped card! Love the colours and the wonderful details...wish I had a pool! LOL! TFS! and for the chance to win the yummy candy! So great! i love the shape of this card and the colors are so much fun! Thank you! What a super cute card!! I just always love shape cards. This one is adorable. This is just super cute, Gloria! I love the pool! :o) Great job! Very cute. You did a great job! What a super cute invite! How creative. New follower to your blog. TFS! Your pool card is super cute! The shape card is so great! What did you use to cut all the wonderful shapes and words? What a cute card...would never have thought of making a pool shape! Such a cute pool card, its so inviting to just jump right in!!! 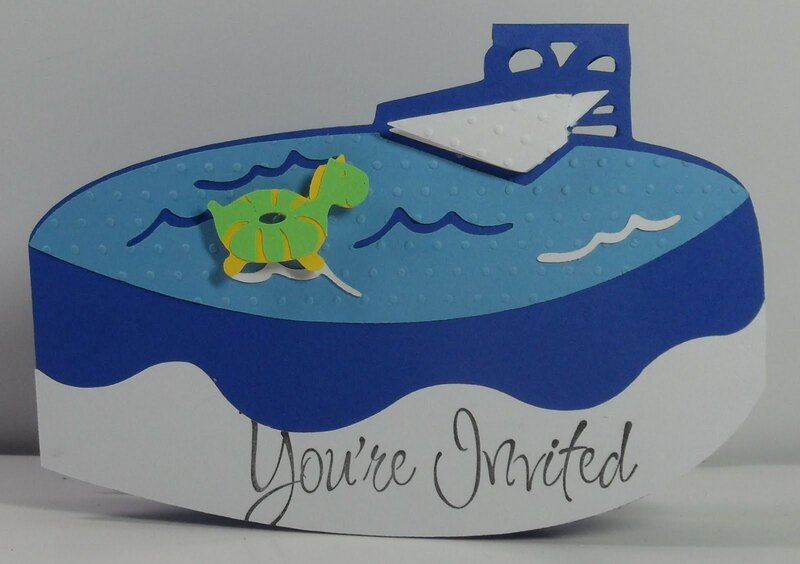 Love the shape of this invite, Perfect for a pool party. Thanks for sharing. The card is so inviting that I wanted a pool today. It was pretty warm here. Thank you for sharing. What a cute card! I am a follower. So Cute! Love the little pool floatie! Totally love your card. Fantastic job. Thanks for sharing. Already a happy follower. Love your shape card! 1st one I've seen like that before. Very creative. :0) Thanks for the chance to win such a generous gift! I'd be so happy to win as I have a couple I've been wanting to build up and have a mini shopping spree. Due to my fibro I only get to have a trip to Michael's once every month or two so thanks for the chance to win! Perfect invitation for a pool party! i just love all your cards. Thanks again for the blog candy! Awesome invite! 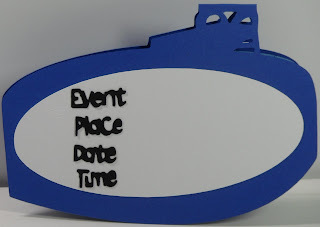 I am planning a pool party this summer too .. so this is very useful! Thanks for participating in the hop and providing some great inspiration! Thanks for the chance to win such a great giveaway .. I could certainly put it to good use! Cute pool! What cart is that from? Cute invite. Like chance to win. What a great card! I love it.... so fun! Thanks again for stopping by to share a comment. A Stinkin' Cute Award and Blogaversary Winners!